HCM City (VNA) – Experts, businesspeople, and students from the Netherlands, Vietnam, and other ASEAN member states gathered at the Orange ASEAN Factory (OAF) 2019 programme in Ho Chi Minh City from April 1-19, working on challenges in identifying and preparing for innovative solutions to sustainable urban development. According to Dutch Consul General Carel Richter, the OAF looks to take advantage of young specialist and student initiatives to solve real sustainability challenges for sustainable development, including environmental issues. Participants will use entrepreneurial and design skills to settle societal issues, while providing direct business values to clients. 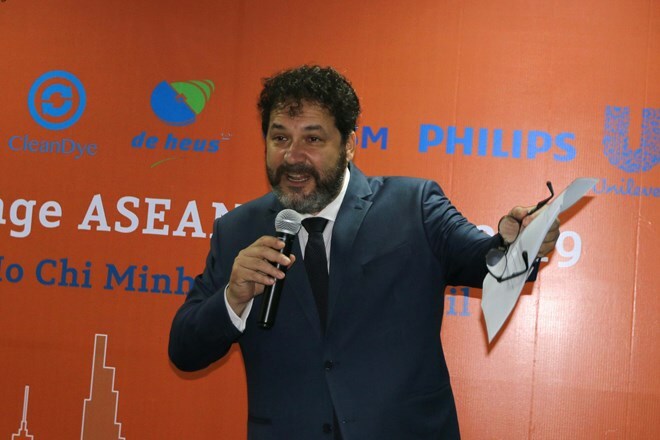 It also offers opportunities for young talents in the field to exchange and share experience in business development, particularly improving knowledge on sustainable development and consultancy skills, as well as expanding cooperation among experts from the Netherlands and ASEAN, he said. Leaders from corporations and international organisations spoke highly of the programme, expressing their belief that it will serve as a basis for companies to branch out their businesses in tandem with corporate responsibility. Orange Factory is an intense three-week sustainability consultancy programme for talented young professionals, entrepreneurs, and masters programme students from the Netherlands and Southeast Asia, initiated by the Netherlands’ Ministry of Foreign Affairs.